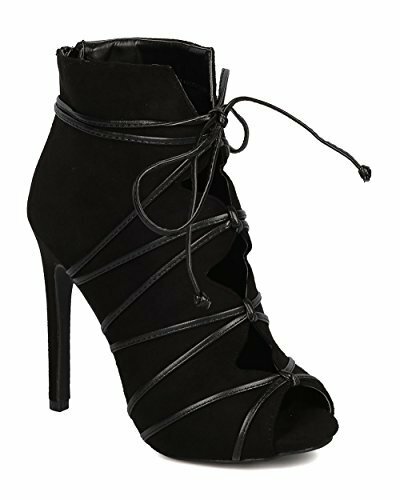 These faux suede booties are made with a peep toe, cutout details and single sole. Also made with wraparound straps, stiletto heel and hind zip for easy slip on and off. MEASUREMENT (tested sz 6; approx. ): Heel: 4.25", Shaft (w/ heel): 8.25", Opening: 9", Toe: 1.75" - True to size, brand new with original or Alrisco shoe box. WORRIED ABOUT OUR ENVORINMENT? : We love animals as much as you do! No animals were hurt during the production of these shoes. They are made with 100% vegan material and the rubber sole is from all man-made materials. Our manufacturers are very environmentally conscious! If you have any questions about this product by Wild Diva, contact us by completing and submitting the form below. If you are looking for a specif part number, please include it with your message.